I had the pleasure of meeting little Miss Presley in March at a couple weeks of age. I met her proud parents earlier this spring for some maternity pictures (the “before” pictures) so I was very happy to come back for the “after” pictures. I was so surprised by how alert and aware sweet Presley was for a newborn! 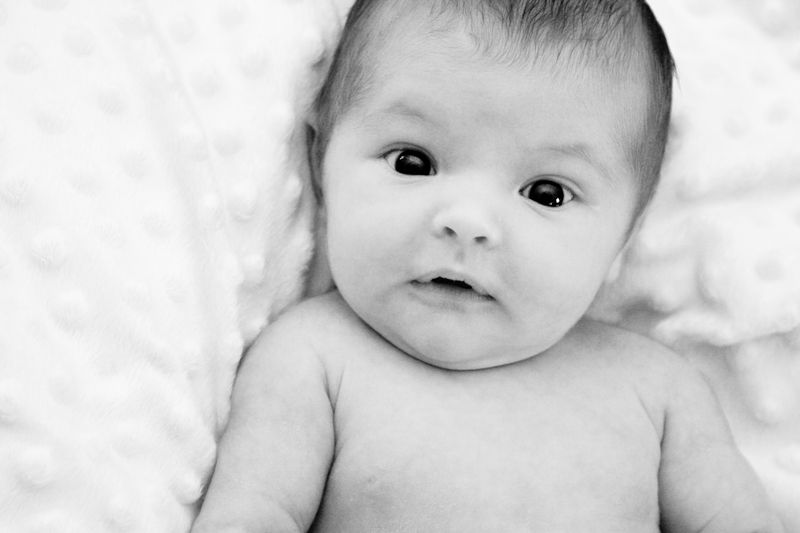 What a good baby she was to photograph – lots of eye contact, some great expressions, and she didn’t complain once! This just makes me say, "Oh hello there!" This next one wasn’t an ideal photo but I just love the look that Presley is giving her mom. It’s that sweet “I recognize you!” look of adoration and it’s just beautiful! I love photographing newborns. For other sessions, I try to stay within a one-hour time span, but with newborns, it could drag out a bit longer. I just love to take time to hear new parents talk about their baby’s personality quirks, sleeping habits, and all the changes that are occuring in their lives. For a single, childless woman, it’s fascinating to me to hear about the adjustments that a new mom goes through – and it astounds me how they handle it all. Lucky for me, I’ve got a lot of pregnant friends and clients so there’s no shortage of these conversations! Wow, I’m a bad, bad blogger lately, huh? No good excuses. I could tell you that it was the holidays, then I went on vacation, came down with a bad cold, and have been busy at work…but really blogging takes 10 minutes of my day so those are pretty lame excuses. I’ll be better – I swear! In all seriousness, this is a really busy time of year for me at “real work” so I’ve been behind on my photos. Last weekend I visited my little buddy Adrianna. She’s 7 months old and so stinkin’ smiley! I really didn’t have time to go through all of her photos the other day but then I saw this one in my catalog and I couldn’t resist spending some time on it. I can’t wait to get to her other photos (and her mom probably can’t wait either!). In other news, my website is currently inacessible…to ME. I can’t upload anything to it right now so I’m relying on the blog until I get it fixed. I guess that means I’ll be blogging more often, right? Right. The past week has been a rough one. On top of my “real job”, I’ve been overwhelmed by volunteer work and boards, photography work, and all the personal junk that clutters up my days…cleaning, Christmas shopping (yes, already! ), bill paying, appointments, etc. It’s been heaven to take time out of my days to develop photos though. Sometimes I wish I could do this full-time because it makes me so happy to start my workflow with a full media card and end up sometime later with a few photos that capture the moment and make me smile. On the other hand, I really like being able to pay the bills soooooo…back to work I go. Here are some shots that made me smile today. On Sunday, I had the pleasure of photographing my friends Joe and Laura’s beautiful children. These two are so adorable – polite, funny, and so cute. And their mom has such a great sense of style! I also had the pleasure of meeting my friends Shawn and Leslie’s sweet baby Harper this weekend. Harper is three weeks old and just perfect. There’s no doubt she’s going to be a beautiful little girl. For more of these, check out the kiddos gallery. You can’t have a family picture without a cute dog in it. I want a dog just so that I can take family photos with it. Maybe I can borrow someone’s dog for my own Christmas card pictures. Don’t get me wrong – I love my pets. It’s just that my cats don’t really aspire to be models. Riley has a touch of canine ADHD. But such a cutie! If their parents ever need a break, I would happily take both of these cutie pies home with me! Buddy is so cute. But as his daddy says, “You have to embrace the fatness.” I tried my best to use only slimming poses for sweet Buddy who was exhausted by his modeling gig. I love animals. I wish I had room for more of them in my life. But my goodness…I thought grumpy children were there worst portrait subjects – nope! This is Hernando, my frequent, but reluctant model. He’s impossible to photograph. Unless there’s a touch of The Nip sprinkled on the set (that would be the crumbs around his mouth and paw). I have no good pictures of my other furry child because she simply won’t stand for it. Dogs seem to be much easier (and significantly less grumpy). My friend Emily of Onesie Couture asked me to take a few pictures of her furry children George and Mini. These dogs were so sweet and well-behaved. And I love Emily’s explanation of Mini’s name (“he looked like George so we called him Mini George”)! That girl cracks me up!